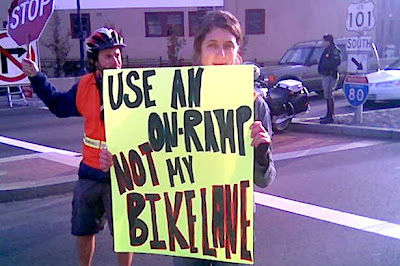 Bicyclists in San Francisco got another lesson in the value of effective advocacy last week. After a horrific near-fatal collision between a bicyclist and a truck, the San Francisco Bicycle Coalition mounted a strong protest, and the city quickly responded with enforcement and safety enhancements. On Monday morning a pickup truck loaded with cement made an illegal right turn onto the U.S. 101 freeway onramp at Octavia Boulevard and Market Street, striking a female bicyclist on her way to work. The woman, who was wearing a helmet, suffered serious injuries and her condition is still very serious. 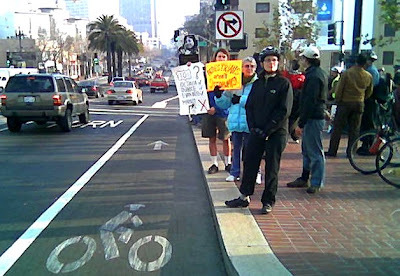 On Friday, January 26, several dozen bicycle and pedestrian safety activists in San Francisco held a protest at the intersection. The protest was attended by several city political leaders (not the absentee mayor)and generated significant coverage by television, online and print media outlets. 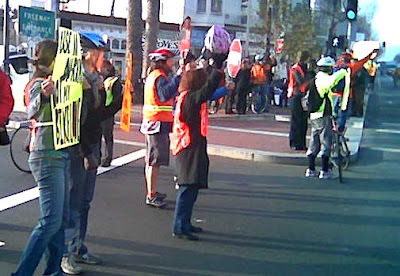 —Scores of concerned San Franciscans took to the streets this morning to demand improvements at the intersection of Market St. and Octavia Blvd., the site where numerous bicyclists and pedestrians have been struck and injured in the 16 months since the Central Freeway ramp opened. Within hours of the protest, the City installed new devices to deter drivers from making the illegal right-turns from Market St. onto the freeway ramp. The City positioned a temporary, electric sign posting the "No Right Turn" message at the infamous intersection, as well as a new row of white, "soft-hit" posts separating car traffic from bicycles and pedestrians. The Police Department added extra enforcement at the site. "We appreciate the improvements the City has made at Market & Octavia in response to the tragic collision earlier this week," says Leah Shahum, of the San Francisco Bicycle Coalition (SFBC), a 6,100-member group promoting bicycling for everyday transportation. "But far more significant and long-term improvements are needed to stem the dangers at this intersection." 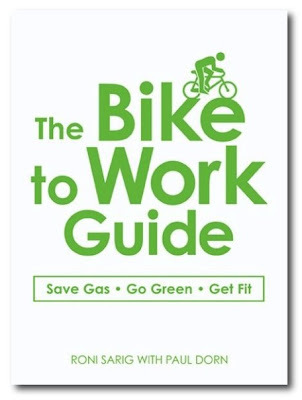 If you are a bike commuter facing challenging streets, the best investment you can make is support for your local bicycle advocacy organization. It has worked in San Francisco, and it will work in your community.